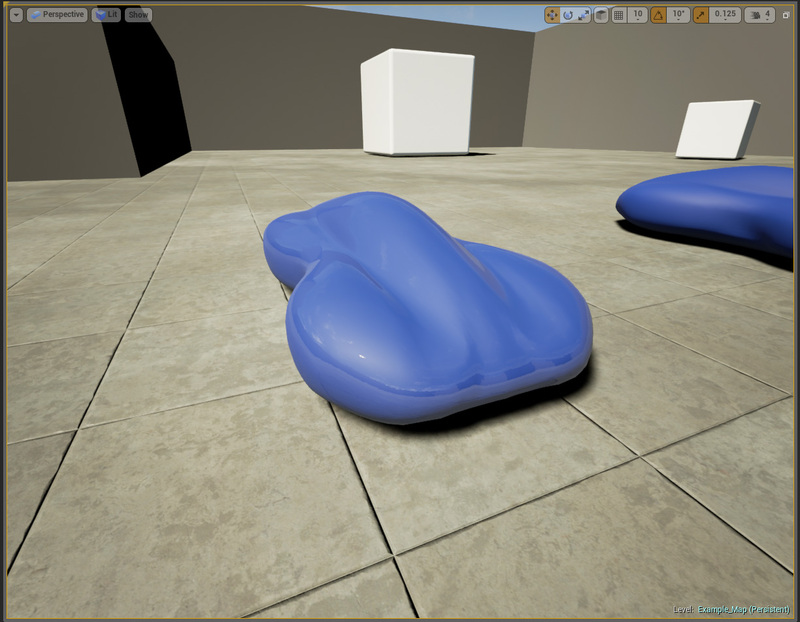 I'm currently working on putting together a package for the UE4 marketplace, which includes the car paint shader. 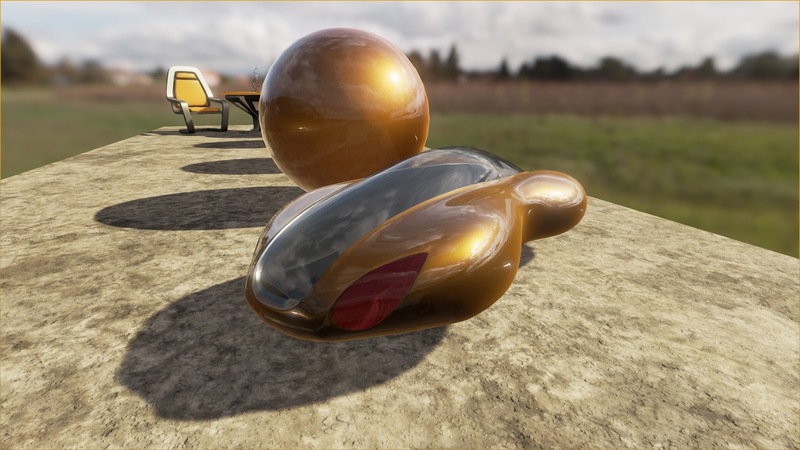 UE4 requires a minimum of 5 unique assets. 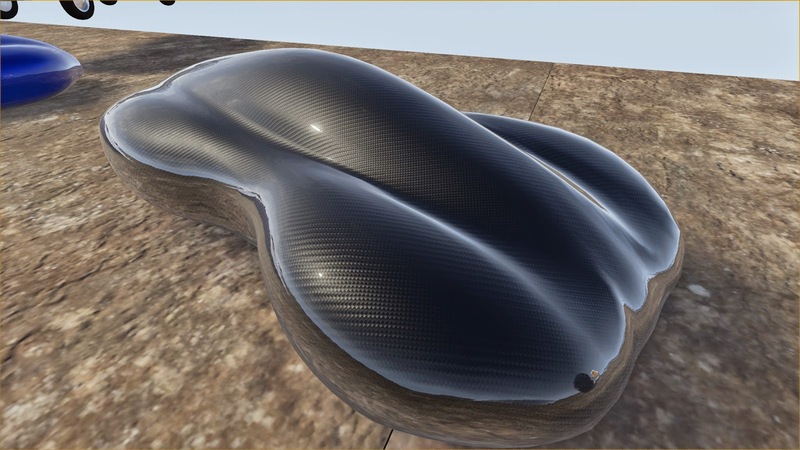 I decided to build a carbon fiber material and a glass material which both take advantage of my reflections system. Take a look at the results! I am planning to have all the assets ready for submission by next weekend. Using Unreal's own vehicle physics simulator, I have put together a very rough blueprint to drive the bike. 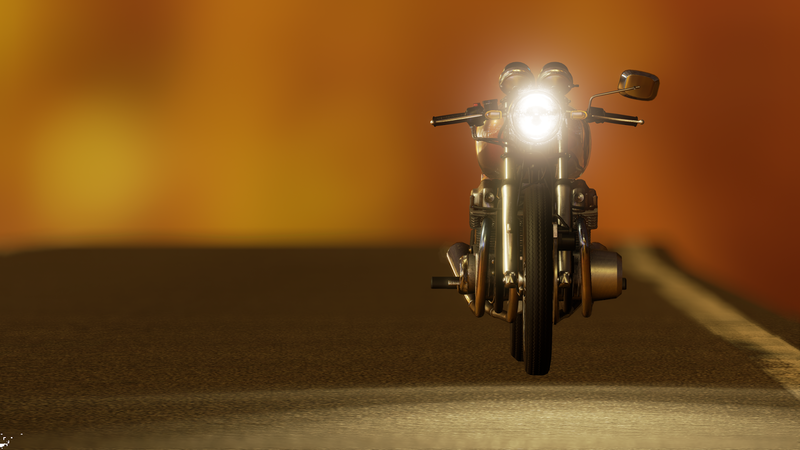 Because the physics engine is optimized for four wheeled vehicles, I will have to do a lot of tinkering to get the desired effect of riding a motorcycle. 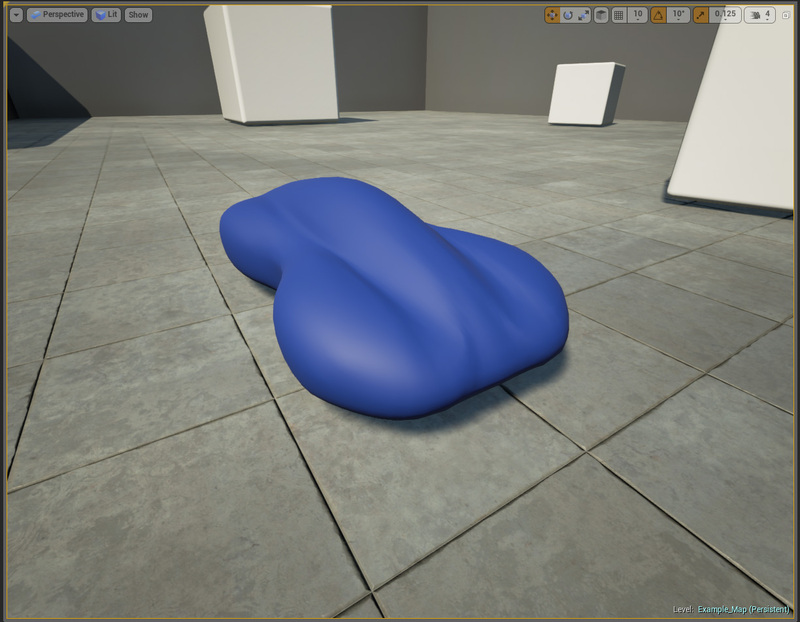 I've also discovered a bug within UE4. While using a scene capture actor with the highest render settings, there is a distracting ghosting effect. In a previous youtube video, I demonstrated the problem and since then, a quick fix hasn't surfaced. It is likely that the problem is hardware related. For now, using the medium detail settings within the editor removes the ghosting, which allows for my carpaint shader to function properly. If you give it a shot, I wish you luck. The effort is certainly worth it! 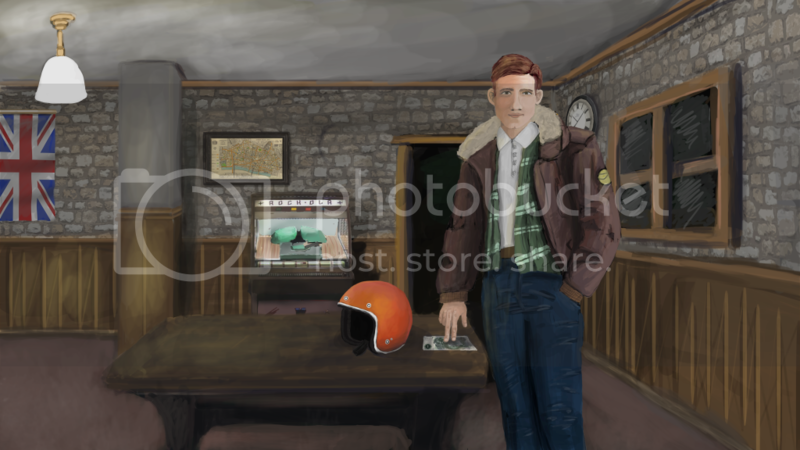 I have spent the day creating a few images to help drum up excitement for Café Races. 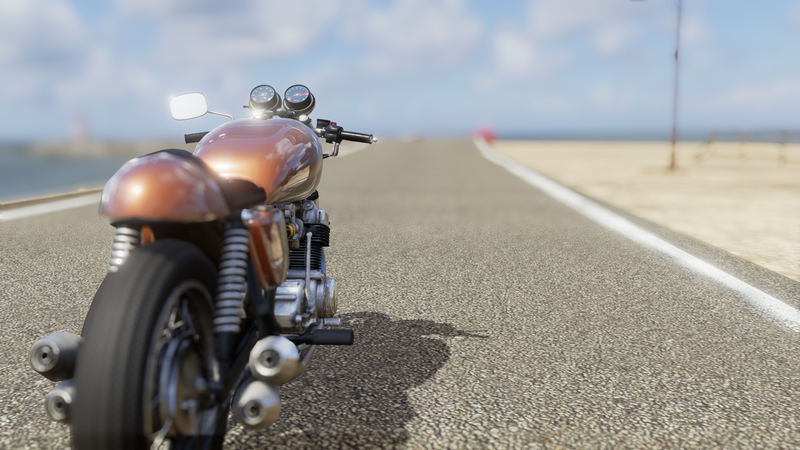 These images represent the final quality of the motorcycle assets. 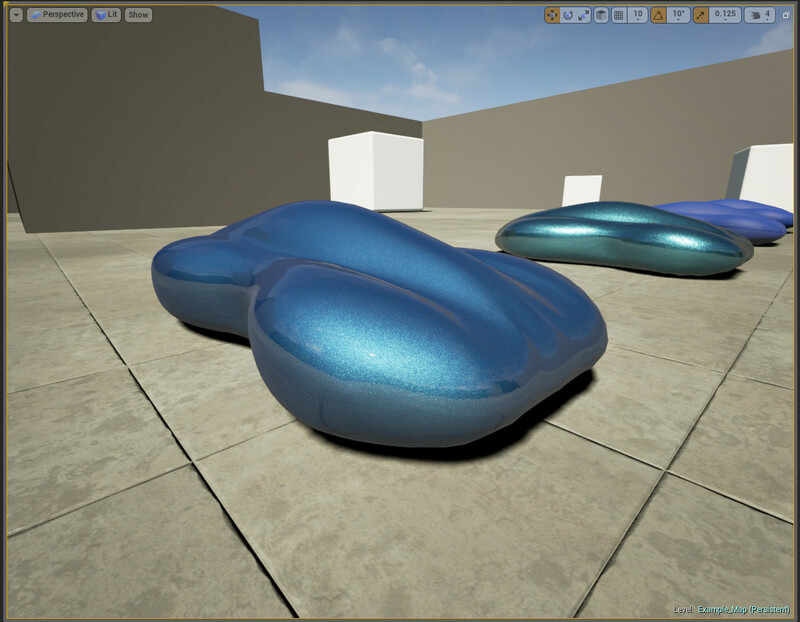 The final car paint shader has been applied and I used more complex lighting methods in UE4 to render the scene. 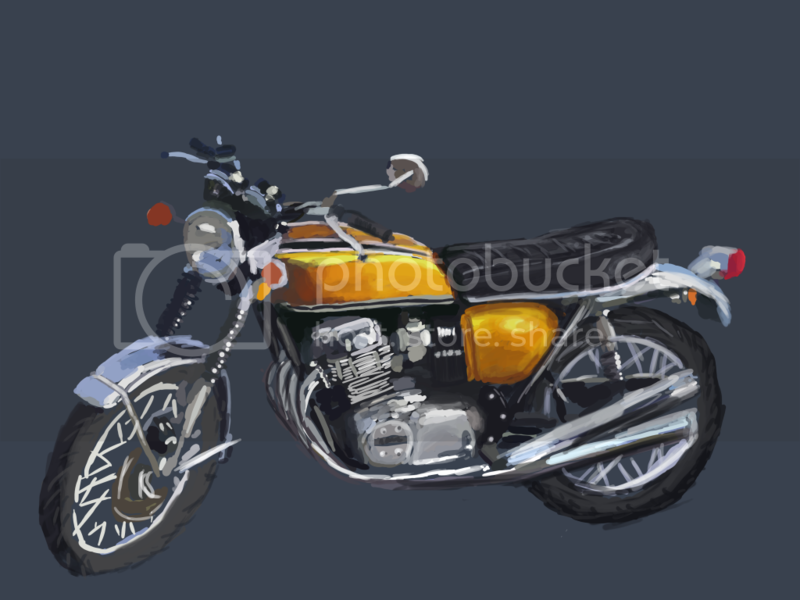 All together, it adds up to images of a bike that I want to hop on and ride into the distance. At 4:30 PM on June 28th I was wed to my best friend and girlfriend of nearly five years. The night was the bet of my life. Every preparation and every handmade craft was well worth the effort. Our wedding was classic video game themed. We spent countless nights creating centerpieces, invitations, a miniature arcade machine, and in secret; my wife's wedding ring. Now that the special day has passed I will have my free time back, which enables me to develop my game at a much quicker pace. 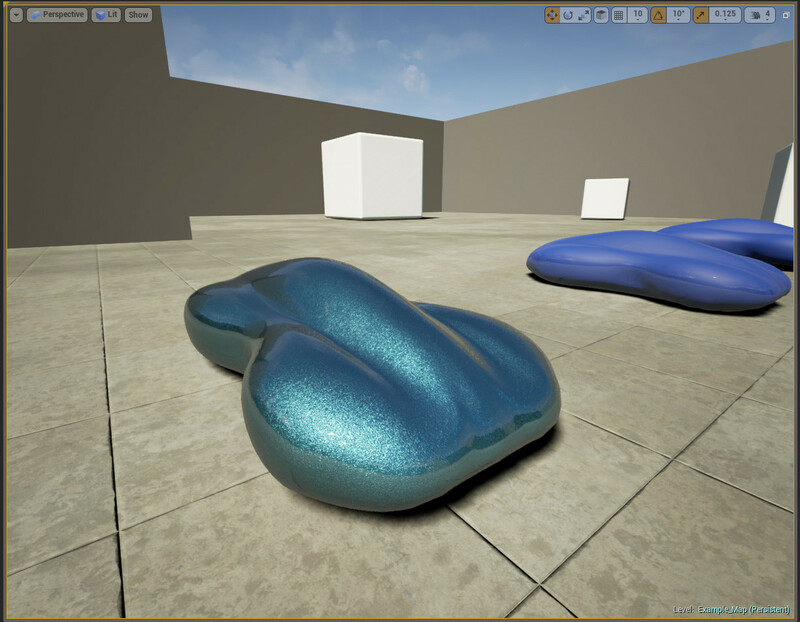 I will be publishing a tutorial on my process for developing a car paint shader soon, to give back to the UE4 community, which has been so helpful to me so far. I will be adding some footage of early, early in-process game play physics as well. And I will be finally putting together a kickstarter to gain the funding which will enable me to work full time on the game. It's going to be a very busy couple of months as everything begins to get underway. I will also update this blog much more frequently! So keep a close eye! 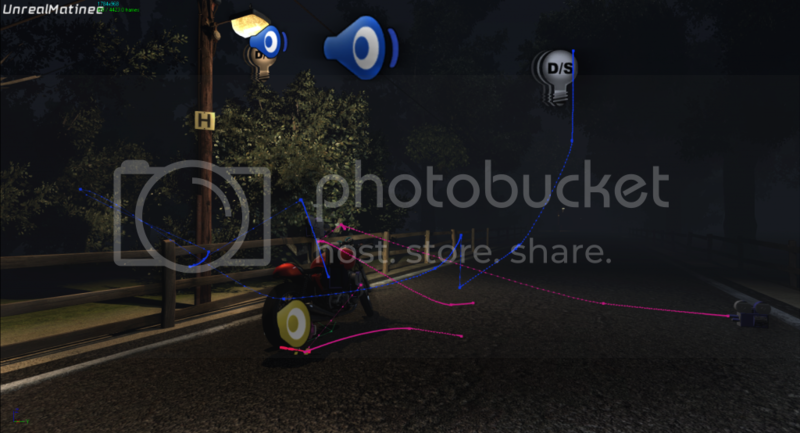 One of the most important features of this demo will be the ability to race several, distinctly different motorcycles. Another essential mechanic is the use of tuning to get the best performance out of a bike. 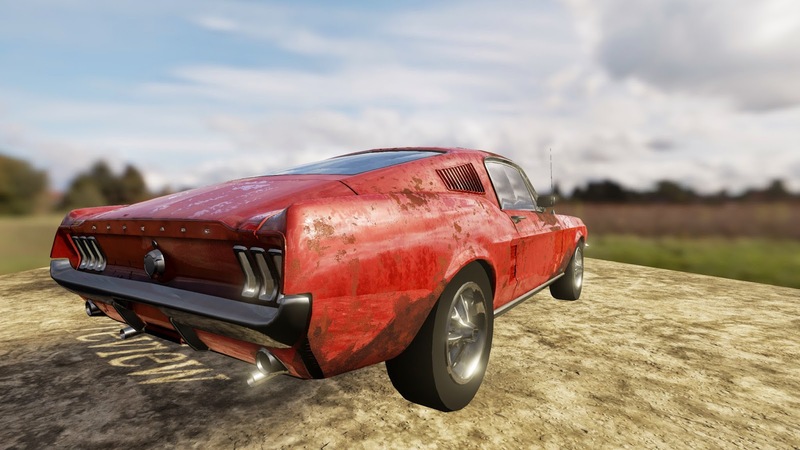 The demo will have a taste of customization and tuning. The actual process of tuning will be done through simple "mini games." 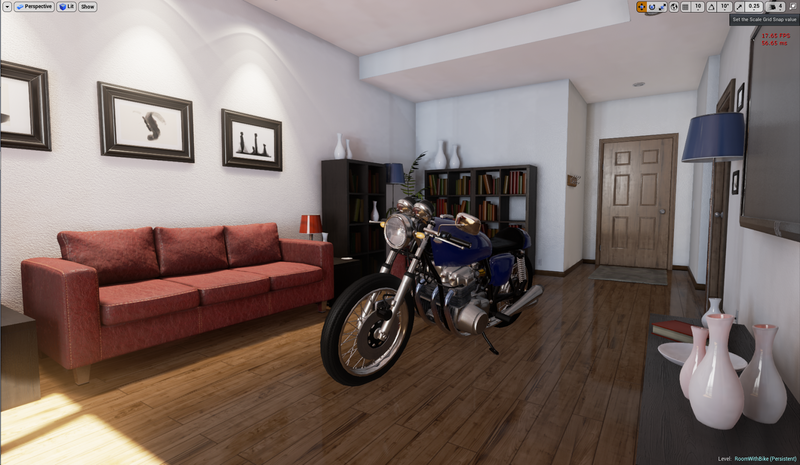 There are a lot of features that I would like to implement and I hope to get as many as I can into the demo. The 1961 Norton ES2, with the featherbed frame was legendary for its handling ability. It could out perform almost any other bike in the corners. 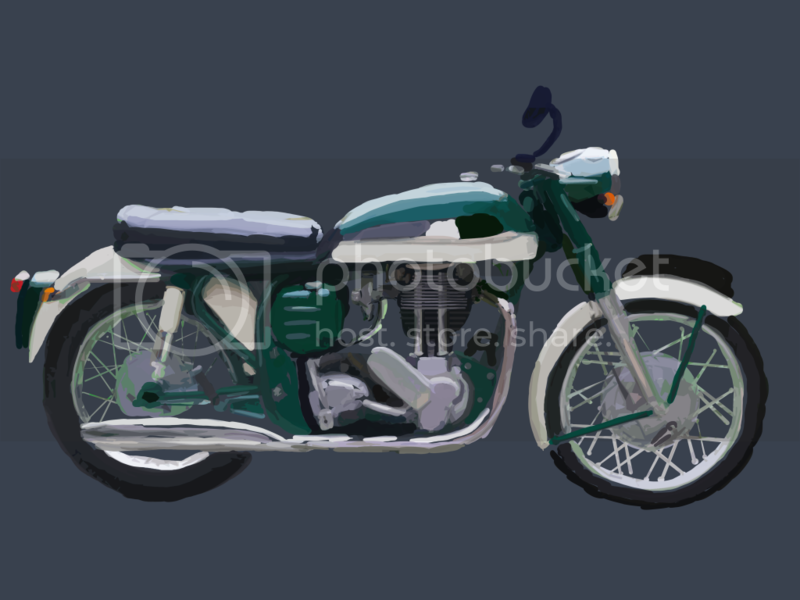 Its single cylinder and single carburetor setup was also easy to tune, and light. Although the ES2 did not have the most power, it was a quick bike. Triumph was making arguably the best motorcycle engines in the 1960s. The Bonneville T120 had a 649cc twin cylinder, twin carbureted engine producing 50% more horsepower than the ES2. Although it was a little harder to tune, it was capable of handling a lot of extra power. The T120 engine was reliable and sophisticated. The twin cylinder also made the Triumph a little heavier than the ES2. 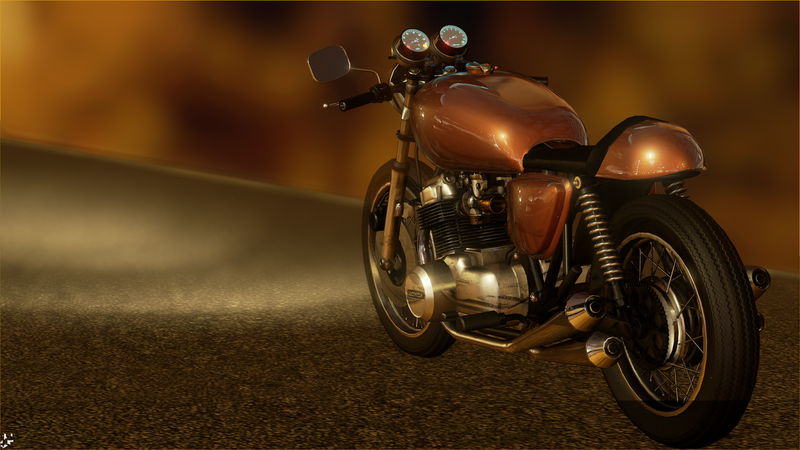 The Honda CB750 is one of the most significant motorcycles in the history of fast bikes. When it was released in 1969 it showed the world that innovation can come from anywhere. Originally designed for the American market, Honda quickly showed the world that it was possible to develop a bike with cutting edge race components, and make it affordable to the average rider. It was faster, stopped quicker, and more reliable than any other bike before it. Over the past few weeks I have had the opportunity to work with Eddie Einikis, a talented concept artist, to produce a few concept pieces that express the mood and visual feel of the game. 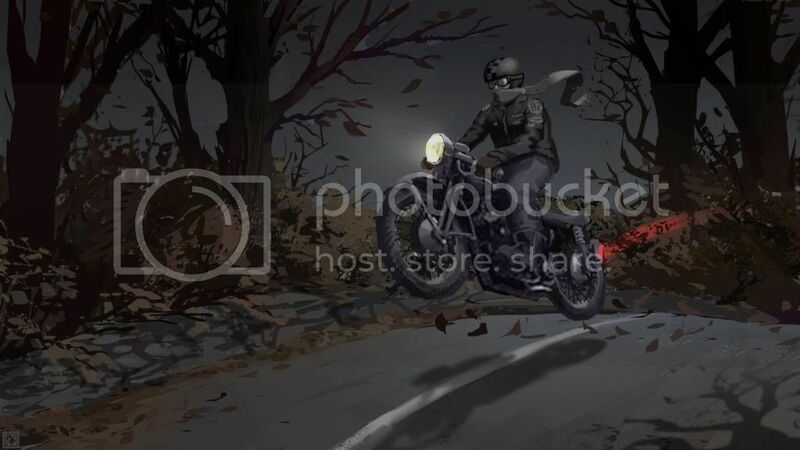 The environment for the demo will consist of narrow country roads lit by moonlight, and the occasional streetlight. 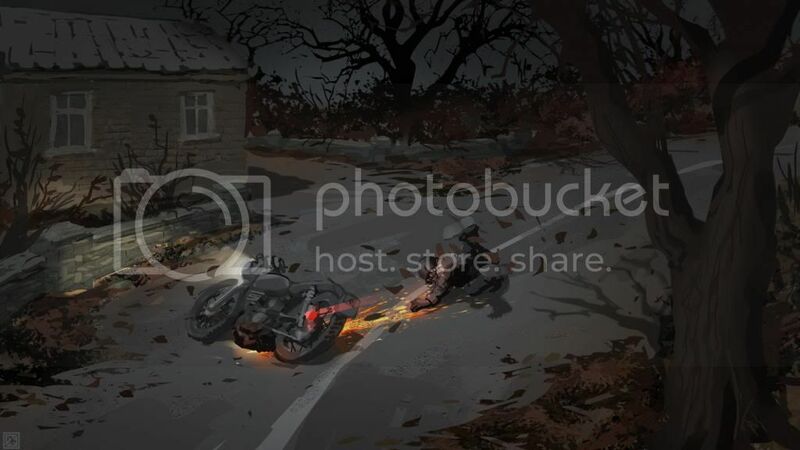 Brush and trees are thick in the English countryside, which mask some of the dangers of riding the roads. Shadows hide curves, bumps, and other obstacles. Those obstacles never stopped the hardened racers, but the dangers were very real. Usually you could bet that the fastest Café Racers of the day would be the quickest to a coffin. English roads in the 1950s and 60s were not ideal for motorcycle racing. Roads were dimly lit, spilled truck oil was common, as were discarded and lost automobile parts. The countryside had even more danger: animals, leaves and gravel. 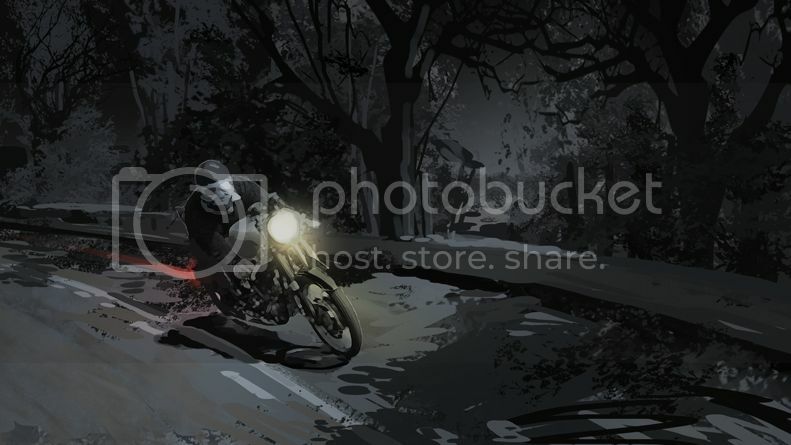 Racing a bike fast on these roads took the kind of courage only a young adult possessed, that feeling of invincibility. Many riders paid the price for their attraction to speed. The thrills of the Café Racer were unmatched. These bikes were specially tuned to be the fastest vehicles on the road, and they were. If your bike wasn't capable of doing the ton (100 mph) then you weren't in the same league. 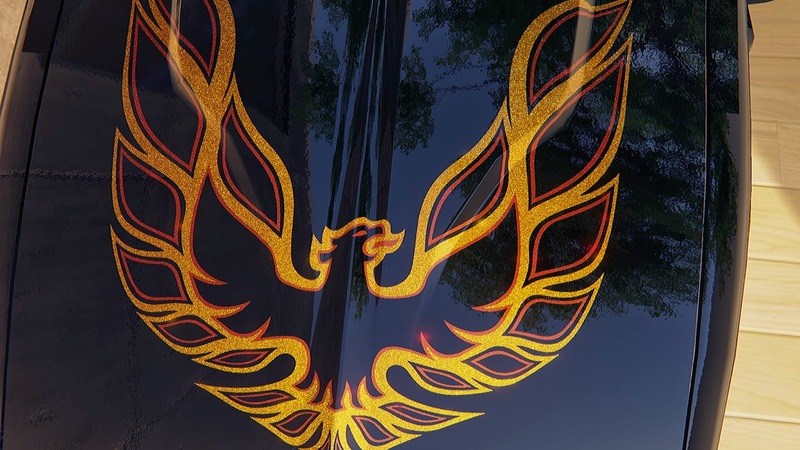 The Café Racer boys had a culture all their own. Each night they would get together at the local cafés to sample new music: Rock and Roll. Cafés were just about the only place where a young adult could listen to the new genre. Cafés were the hubs for their culture, and they will be the racing hub for this game. 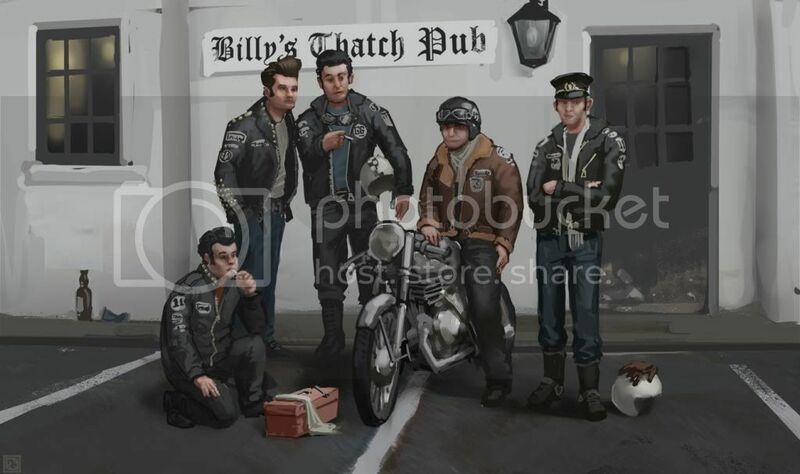 While listening to the Rock and Roll at the cafés, the boys would bet each other who had the fastest bike, and who had the resolve to race them. A new sport emerged. Racers would bet that they could start a song on the jukebox, hop on their bike, race to the next café and back before the song ended. This will make up the primary mechanics of the game. Players will select a course, pick a song, make a wager, and then race! The more bets they win, the more money they have to spend on tuning their bikes. The players will also be able to earn enough money to purchase new bikes. The project is in its infancy. 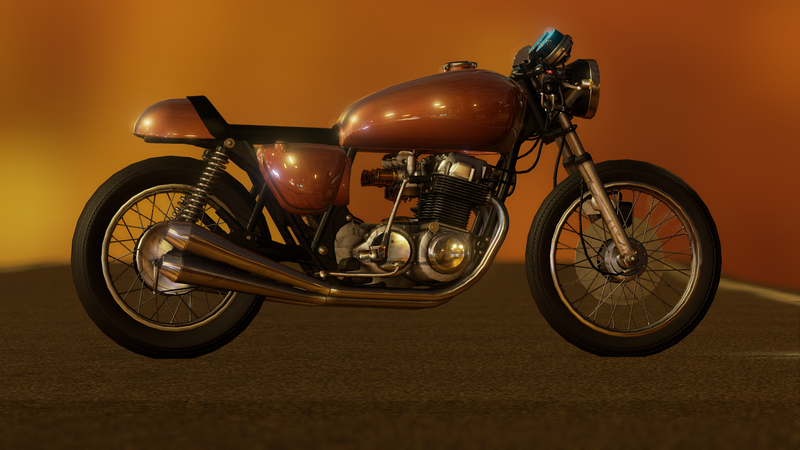 The visual showcase of the CB750 was completed on January 1st. The purpose of the showcase was a proof of concept. 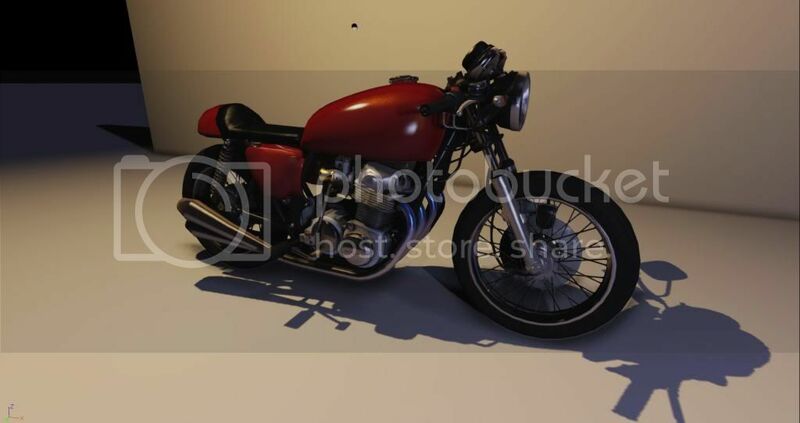 I wanted to know if it was possible to get an extremely detailed model of a vintage motorcycle running, with animations and complex shaders, in UDK. I posted the video on reddit and found that there was a large number of people that were excited to see this high level of detail. Because of those reactions, I decided to go ahead an commit all of my effort into continuing this project. The scope of the full title is ambitious and will take a lot of work and help from others to complete. The demo's purpose is to reach out to the entire gaming community and find its audience. 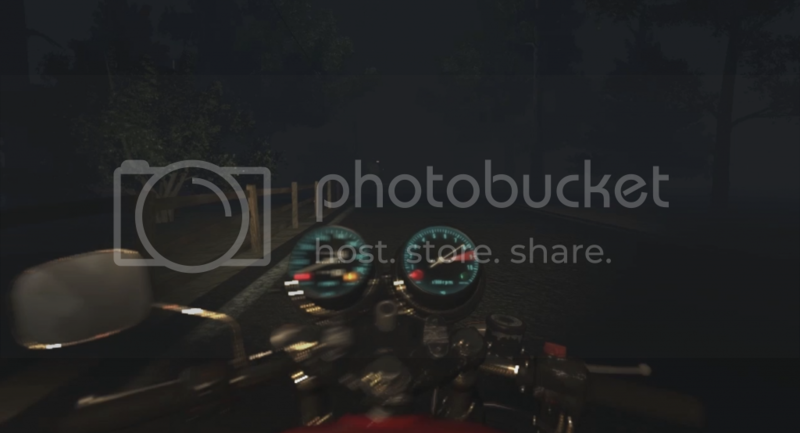 Motorcycle enthusiasts can already see the potential of a vintage motorcycle racing game. My current task is to prove to everyone else, that it will be a unforgettable gaming experience. 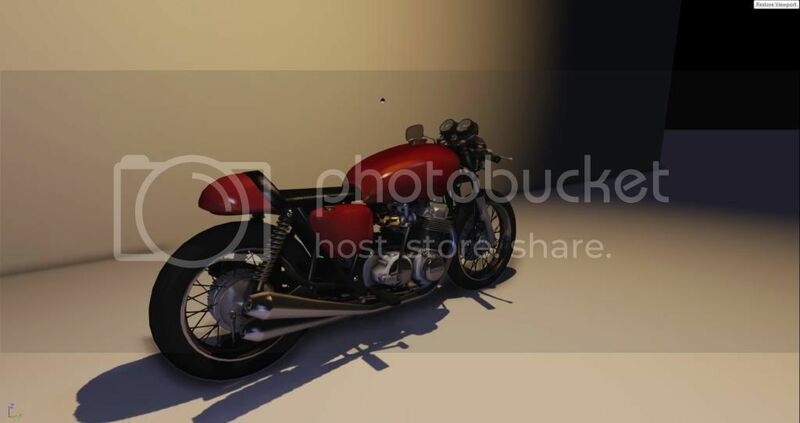 These images are from the development of the CB750 showcase. 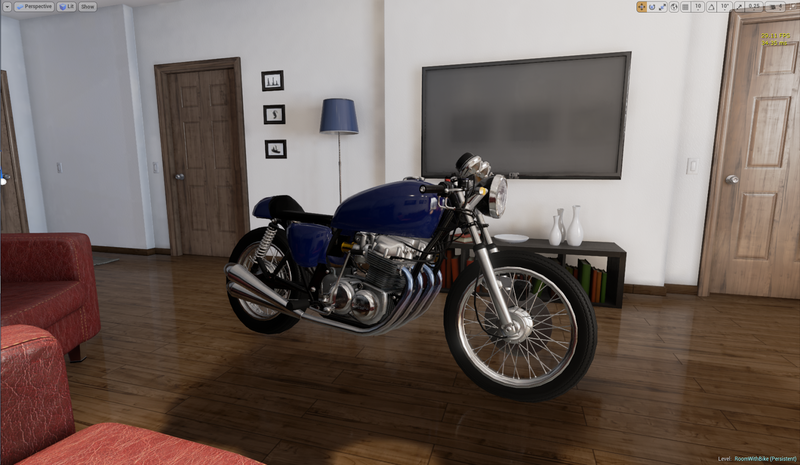 Some of you may be wondering why I chose to create the CB750 first. 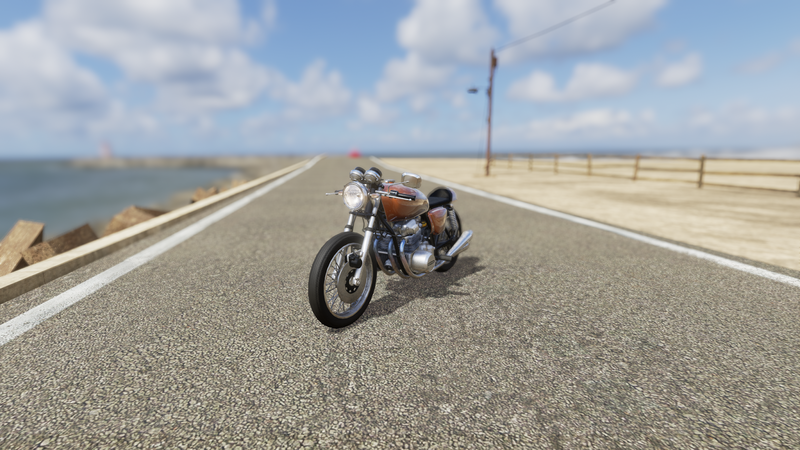 I created this bike because it is my first motorcycle. It is a bike I have been restoring for the past year. I had exact measurements, easy reference, and most importantly a platform to record audio. The Honda is the first of three bikes for the demo. 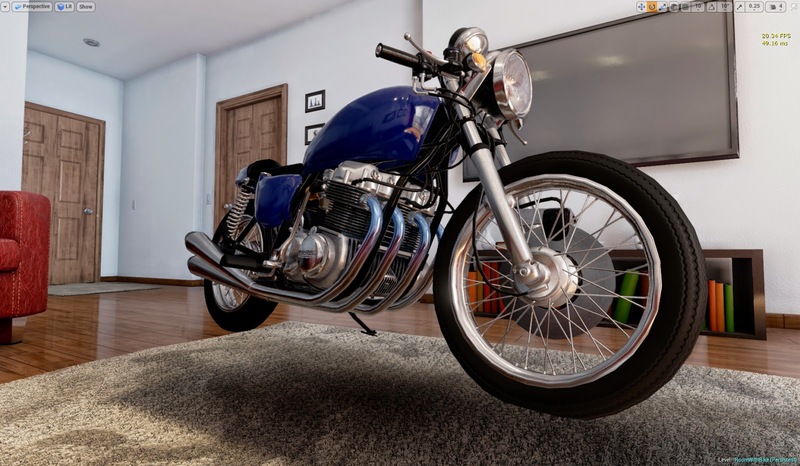 The game will be primarily focused on British bikes from the 1950s and 60s but CB750 was the beginning of the end of British motorcycle superiority when it was released in 1969. 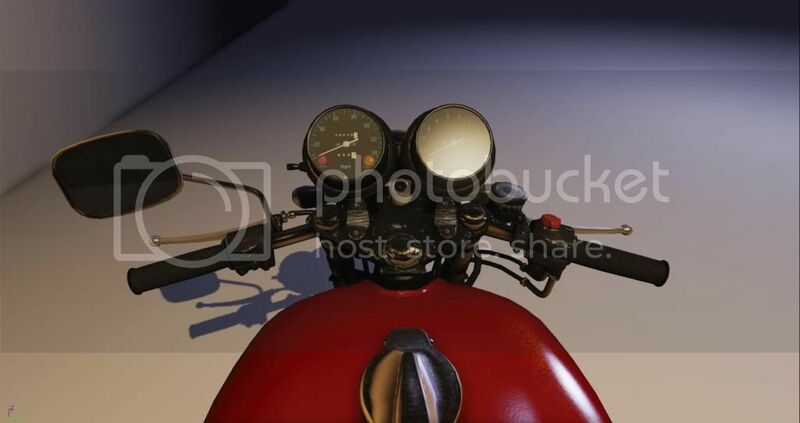 It was responsible for the creation of a new term to describe its speed and abilities: Super Bike. Many love it, but some consider it to be tame, without soul. 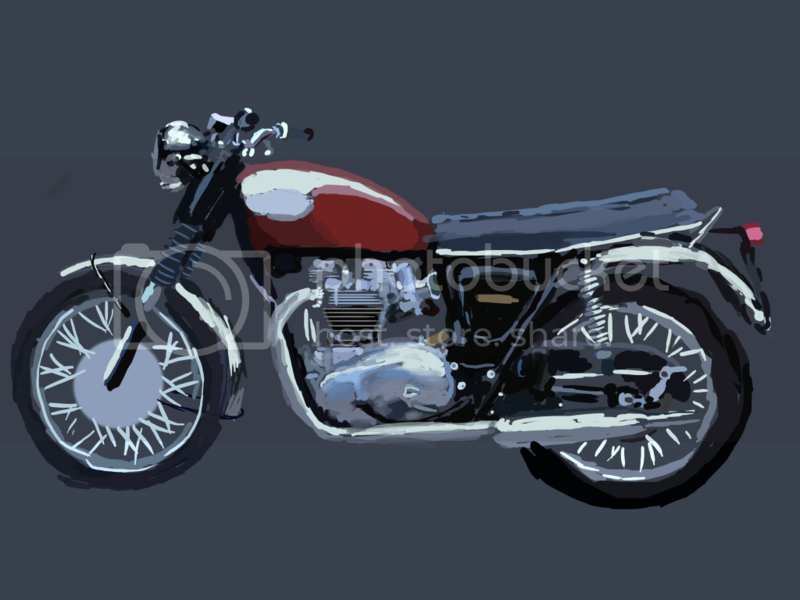 It will provide contrast between the British bikes and illustrate the difference between them. This image is pulled straight from the showcase. The game demo is being developed for a first person experience. Despite not having any rendered character assets, this image closely represents the visual quality that the demo will posses. All the camera animation and audio was entirely in engine. These images are from the middle of developing the showcase, the first time most of the shaders were in place, in a simple form. 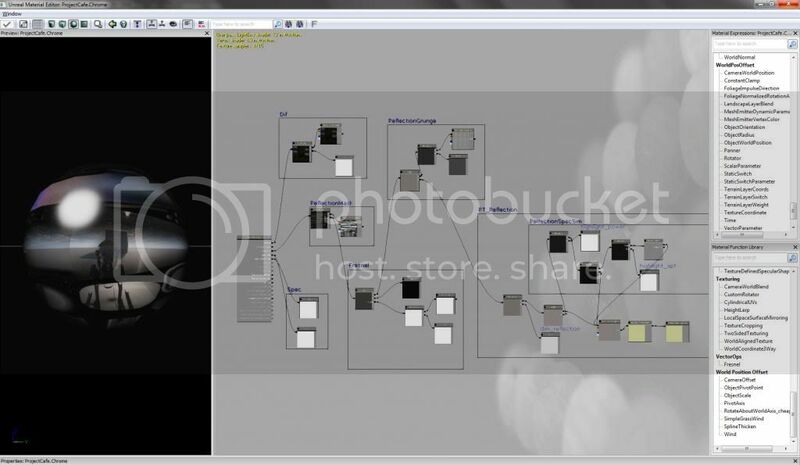 There were many tweaks and added features to the shaders before the showcase was completed.